I was thirteen when Twister came out in 1996, just the right age to enjoy such a dumb movie. And dumb it inarguably is. With horrible acting, unbelievable special effects, and a plot that’s about as likely as my computer sprouting wings, it’s a film that relies on the ridiculous to succeed. But succeed it did, raking in millions and ultimately becoming something of a cult classic. The cast is what makes it, a bunch of stars that, at the time, often got together to make terrible disaster movies, like Dante’s Peak, Volcano, Deep Impact, and The Perfect Storm. Bill Paxton, Helen Hunt, Cary Elwes, Philip Seymour Hoffman, Alan Ruck, Jeremy Davies; you don’t see casts like this for this genre of movie these days. Into the Storm is basically a Twister remake, kicked up a notch, but failing to secure the actors or publicity needed to become something with a cult following. Too bad, since it’s actually better. School’s almost out and it’s graduation time in Silverton. Donnie & his brother Trey are working on a video time capsule, capturing moments that they & others can look back on years from now. Also filming the town, but for a completely different reason, are documentary filmmakers Pete, Allison, and their crew. They’re storm chasers and hope to capture a tornado on camera before their funding runs out. If just so happens, on graduation ceremony day, that a storm system develops with the power to create tornadoes that no one has ever seen before. So while the crew drive around in their weather van & tornado tank, the rest of the town seeks shelter from what might become the most ferocious storm in American history. Donnie, Trey, & their dad Gary go on the adventure of a lifetime, trying to survive & to help others, all while spending one terrible day inside the fury of this massive storm. It might be hard to believe, especially if you’re a fan, but this movie is better than Twister. An almost exact copy, sure, but an improvement. You’ve got the adult love story, the weather research mission, the douche bags, the locals, and a place that’s about to be wiped off the map. It might sound the same, but this movie takes everything up a step, becoming something bigger & better. 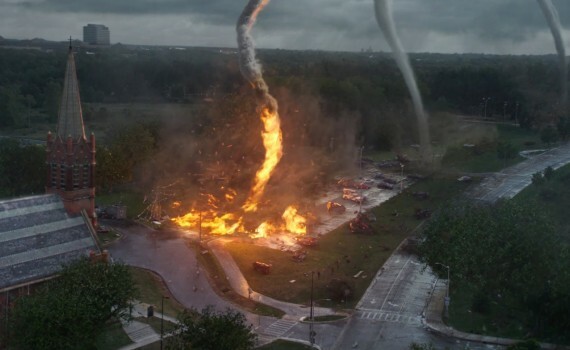 Cooler tornadoes, epic camera angles, awesome effects, excellent deaths; it’s a disaster movie that does the genre justice. But it’s only kinda corny, only a little over the top, making it different from Twister or even, to a much more ridiculous degree, Sharknado. Both are bad, but save themselves by being tongue-in-cheek. Into the Storm might rub people the wrong way by not admitting that it’s crap, by trying to be something greater. The acting isn’t greater, that’s for sure; Richard Armitage & crew were all absolutely dead inside for the entirety of the film. But, again, they didn’t go so far over the top as some have done before, tried to keep the story more level, and succeeded in a little higher quality show. It’s not the farce you might expect, neither is it a perfect drama, but something watchable in between that you just might enjoy.